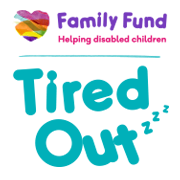 Tired Out is Family Fund's sleep support hub for families raising disabled and seriously ill children to find help and information about sleep issues. The hub is a website and was created by Family Fund in partnership with charities such as Scope, National Autistic Society and Contact to provide information about bedtime routines, night waking, sleep facts and much more. Find out about sleep services in your area. Take a look at our sleep tips to find out about anything from routines and diaries to sleep food and bedroom environment. Read academic research papers and articles relating to sleep problems among children with assorted difficulties, disabilities and/or additional needs. Find useful products and resources that might help. If you have anything you would like to add to the site or have questions or queries, please email us at tiredout@familyfund.org.uk.